In Japan, the chrysanthemum, or kiku, is not just a beautiful flower, but the symbol of the sun, perfection, long life, power and nobility. It is the official flower of Japan and the seal of the Imperial family of Japan, as well as the insignia on every Japanese passport. The Emperor, representative of the oldest continuing hereditary monarchy in the world, rules from the Chrysanthemum Throne, symbol of the state and the unity of the people. 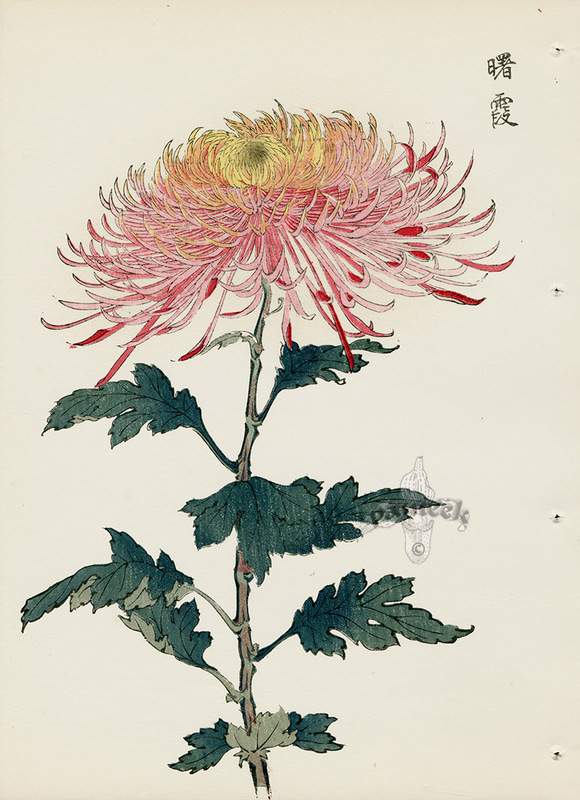 Artist Keika Hasegawa translated the graceful beauty of the flowers to the page in One Hundred Chrysanthemums, printed in 1893. Each delicately-colored woodblock print features a perfect bloom balanced atop a long single-stemmed plant. In life, cultivated through the art of ogiku ("single stem"), these plants can reach six feet tall with enormous blossoms the size of softballs. Chrysanthemums came to Japan from china around the 8th century A.D., and the Emperor adopted the 16-petaled flower, or Ichimonjiginu, as the crest and official seal. Each fall during the "Festival of Happiness," cascades of chrysanthemums decorate temples throughout Japan. Kiku cultivation reached perfection in the 19th century, when Hasegawa created his prints. Today, Chrysanthemum Festivals are held throughout Japan in October and November. Prominent in the festivities include large exhibits of chrysanthemums in pots, carefully cultivated all year, that are of a size and magnificence rarely seen in the West. It is our favourite time of the year to visit Japan, and we love visiting the kiku exhibits. 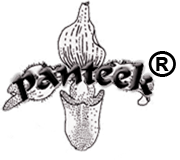 Panteek offers these delicately colored original woodblocks on creamy-toned washi paper from the edition published in 1966 by Unsodo in Kyoto. Each print measures approximately 8 3/4" wide by 12" tall for the single prints and 12 by 16 1/2 for the double prints, with the central fold as originally issued. These prints are now exceedingly rare and highly collectible. Original binding holes as shown on the right will frame out. The condition is excellent, with soft wide paper and very vibrant colouring.